Unless you’re living under a rock, you’ll know that Miniso has taken the city by storm. Why? Because they've been coming up with outlets one after the other, each one as successful as the last. Venturing further into the North Delhi area, the Chinese giant has opened an outlet in Model Town, and it’s a big one! As you enter the store, you’ll see the usual merch that is characteristic to Miniso. Youll find shelves full of accessories, such as bags, hats, sunglasses, and more. They also have a section of summer-friendly slippers and delicates with a variety of options to choose from. What we personally really like, is their collection of basic t-shirts, camisoles, and cotton socks, that all come in a number of solid colours. If you’re looking for stuff for your home/kitchen, you’ll find lots of things to take back with you. They’ve got really pretty mugs, bottles, sippers, lunch boxes, and some kitchen appliances. We really took a liking to their tea infusers and bottles that come with inbuilt infusers, for those who like to flavour their water with fruits/herbs. What seems to be a real hit at this store in particular, is their beauty section. 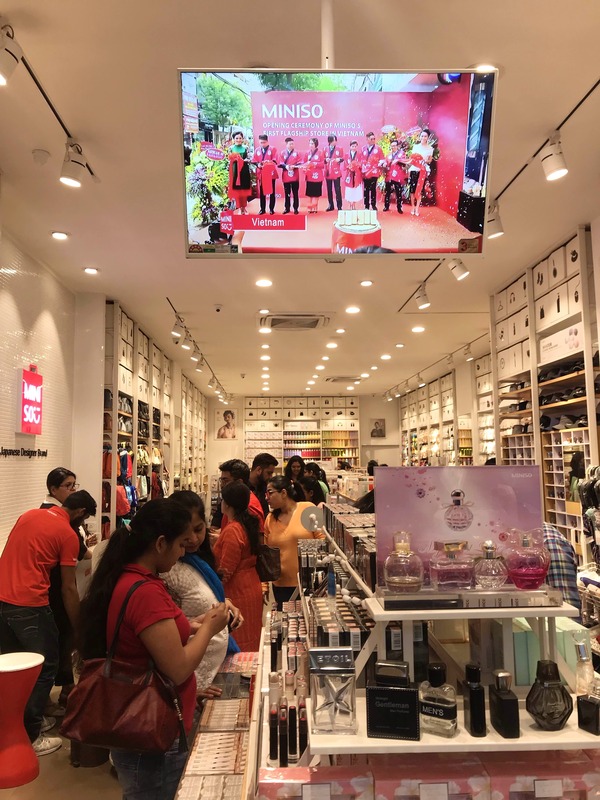 Miniso recently brought its beauty and skincare products into the store. They’ve brought in make-up products, like lipsticks, eye-shadow, and the like (we wouldn’t count on it for longer wear though). We didn’t see any products like concealers, foundations, and fixers, though. They also have nail paint that can be removed by peeling it off, which seems more hassle-free than the remover routine. We’ve heard good things about their toners and night creams. The stationery section (read: our favourite part of Miniso) isn’t very big in this store, which we found disappointing.